The Carriage House Condo is situated in the heart of Beaufort just a half block from the historic waterfront. Walk to the one of a kind shops and gourmet restaurants. Sit on the waterfront docks and watch the yachts come in. If you are lucky, you will see wild horses just across the water on Carrot Island or porpoise playing in the water. Beautiful beaches are just a short drive away. The Carriage House is tucked safely behind the main house amid beautiful gardens. There is a large tree covered deck with a hammock and lots of seating to enjoy on a relaxing evening or with a cup of coffee in the morning. The Carriage House has been totally renovated and is well appointed for your comfort. Please be aware that the Condo is on the 2nd floor and stair climbing is required. Beaufort was established in 1709. Many of the beautiful old homes still line the tree covered streets beckoning strollers to stop and dream of times gone by. Due to the Carriage House's perfect location in the heart of old Beaufort, you can park your car in our off street parking and walk to all Beaufort has to offer. The Carriage House is dog friendly! We provide dog beds, dog dishes, treats and doggie towels. There is a $30 pet fee. If you're bringing your 4 legged family member, please be sure to check that on you reservation request. Located in the heart of historic Beaufort. 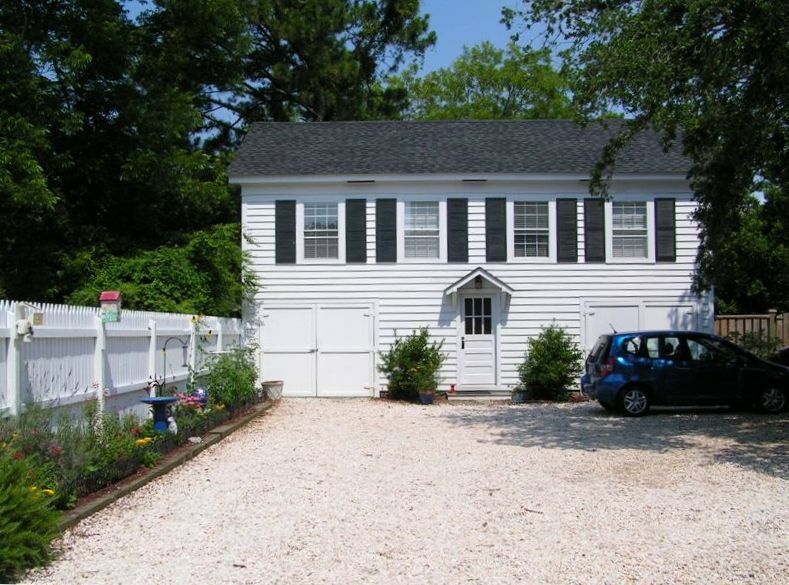 Just 1/2 block from inland waterway and boardwalk. Kayaks may be rented just down the street. If you bring your own kayak or paddle board, you may put in just down the street about 1/2 block from the Carriage House. We have 4 bikes available. 2 are fairly new and 2 are older. We had a great weekend at Molly's cottage, Molly and her husband were great hosts. They greeted us upon arrival and shared some local info with us. Their cottage was very clean, quiet and cozy. we will definitely stay there again! Great little place! Location was perfect and close to everything! We stayed as a family of 4. The condo is small, but very space efficient and is very well stocked with those little extra odds and ends you need. Everything was clean and comfortable. Best part of this condo is the location... we loved being able to easily walk downtown and walk down to catch the ferries to the islands nearby. Molly is an excellent host! The summer just doesn’t seem complete without a visit to “Molly’s”! Both the two legged and four legged guests enjoy our stay so much and it couldn’t be more perfect year after year! You’re missing out if you choose anywhere else in beautiful Beaufort! It was so nice to see you again!! Glad you enjoyed your time in beautiful Beaufort. Lovely place! Lovely hosts! Super dog friendly! Killer location! We highly recommend staying here! The carriage house was a fantastic place to stay. The accommodations were comfortable and wonderfully dog friendly. We loved it! Beaufort was voted as the coolest small town is America. The Carriage House is located in the heart of downtown Beaufort. The waterfront is literally just steps away and shopping and restaurants are just around the block. The Maritime Museum with its Black Beard/Queen Anne's Revenge display is just down the street. The Nat'l Park Service ferry to Shackleford Banks is at the end of our block as well as other ferries that will take you to the smaller islands.